During the last five years we have taken on two projects in Trinidad, Cuba. In conjunction with the ICAP ( The Cuban Institute for friendship with people ) and Amistur, two Cuban groups which work on international solidarity projects with other countries, we have been supporting the work of the maternity home and the elderly peoples day centre in Trinidad, a small town on the south coast in Cuba. Although the medical and social care programmes in Cuba are a beacon of good practice for the whole world, the US blockade of Cuba has resulted in a severe shortage of affordable home comforts for the residents of both of these two centres. We have been privileged to visit these centres several times to learn about Cuban maternity and elderly social care and to take the special donations we have raised in Brighton. In February 2015, two of our members, Sylvia and Clara Knight visited both the maternity home and the Casa de los Abuelos. They met staff and those people using the day centre. Under the auspices of ICAP and Amistur, they were able to co-operate in a project to help provide additional equipment for the Casa. 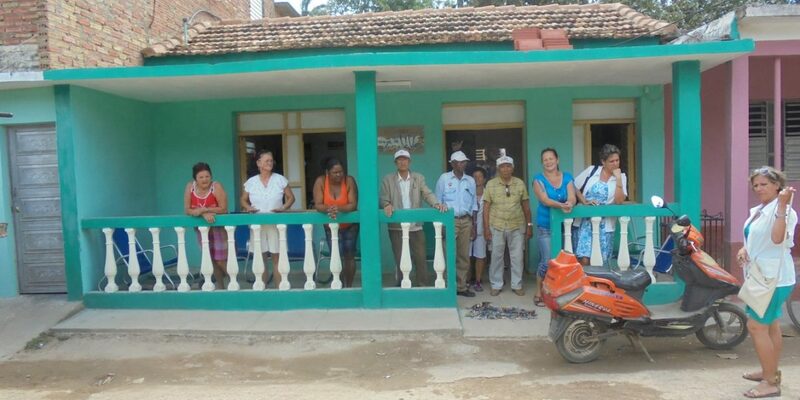 We encourage people to visit Trinidad, in Cuba, and see our projects working.